Subcontractor’s highly productive VMCs will give any competitor a run for their money, from Budapest to Beijing. A seminal moment has arrived in British manufacturing, it appears. Using the latest ultra-highspeed machine tools, UK subcontractors can rival their competitors in low-wage countries and still make a profit. Paul Cobb, managing director of Nottingham contract machinists, Hemlock Engineering, describes how this is possible using 30-taper Brother Speedio machines from Whitehouse Machine Tools. He has calculated that the average 8-second chip-to-chip time on his 40-taper vertical machining centres (VMCs), of which he has 20, costs his company £400,000 per year in idle time for tool changes alone. The 1.4-second chip-to-chip time of the Brother Speedio would save Hemlock nearly a third of a million pounds annually if he operated 20 of them. The received wisdom in UK manufacturing is that lower volume, higher complexity work has tended to stay on these shores while higher volume production of simpler components has largely disappeared abroad, notably to the Far East and more recently to former Eastern bloc countries. 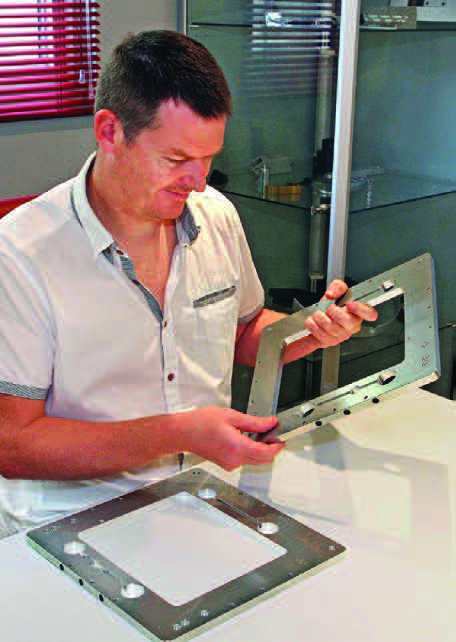 Mr Cobb said, “Half of the parts we make are exported and most of the remainder end up abroad via our UK customers. OEMs are global and can have their components made anywhere in the world. “Two or three of our contracts for annual quantities of 10,000 or more are under attack every year on internet auctions from competitors outside Europe. “OEMs are always looking for lower prices. Subcontractors in the UK and presumably other Western European countries as well often do not get an opportunity to pitch, as their rates are expected to be too high. “It is true that we would lose money doing this type of work using our 40-taper machining centres, even at the lowest hourly rate feasible. He also explained that, with a 4th axis indexer fitted, one operation can frequently be saved compared with using a 3-axis machine, which can reduce floor-to-floor time further, by up to a factor of three overall, cutting costs even more. Instead of being 10 or 15 per cent too expensive, Hemlock can be a similar margin under the competition when quoting, or even more, so can realistically take on high-volume work and still make a profit. Production rates two to three times higher Mr Cobb is optimistic about the possibility of winning such contracts. 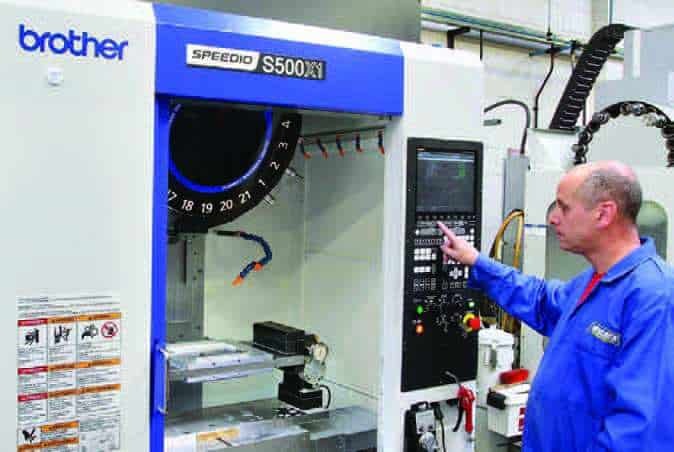 He cites the initial job put on his first Brother Speedio S500X1 4-axis machine, which is equipped with a Kitagawa high-speed CNC indexer. 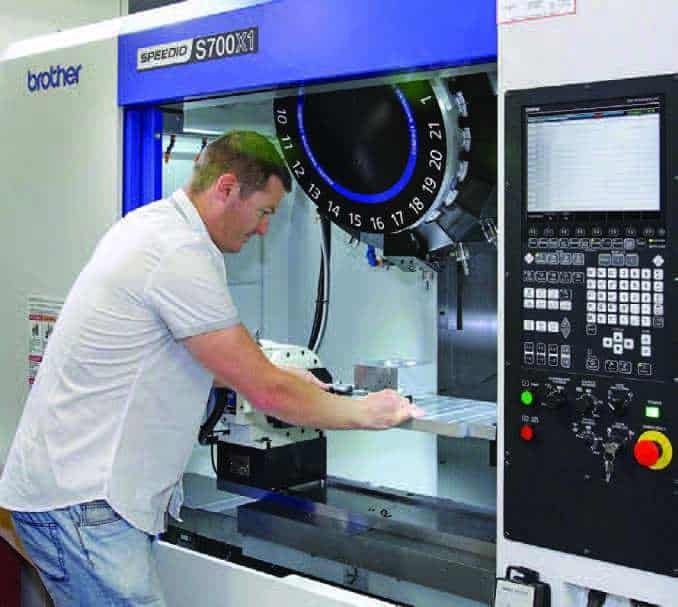 Whitehouse Machine Tools had demonstrated a turnkey manufacturing solution on the machine at its Kenilworth technical centre to show that the Japanese-built machines are a viable route to high profitability. The application involved producing a pair of left- and right-hand plates for a printer, 380 mm square by 12 mm thick, from solid aluminium. For many years, Hemlock had been machining the plates two pairs at a time in two operations per plate on a 3-axis, 40-taper VMC in a cycle time of just over 48 minutes, or 24 minutes for two components. This included five minutes to refixture them all to drill holes in two opposing sides of each plate. Manual deburring of sharp edges took extra time, so in practice only four plates per hour were produced. On the 4-axis, 30-taper S500X1, which has a working volume of 500 x 400 x 300mm, a single pair of plates is machined in one hit over twice as quickly, in a 12-minute cycle. It includes deburring with a milling cutter, so the parts are ready for delivery immediately they leave the machine. The production rate is therefore 10 plates per hour, ie 2.5 times higher. If the through-spindle coolant option on the Speedio had been chosen, the cycle time would have been even faster at just 8 minutes, equating to 15 plates per hour, or nearly four times the original production rate. The productivity hike from the first machine, installed in August 2014, was so great that Mr Cobb decided to replace three additional 40-taper machines straight away with Brother Speedios. Two further identical models were installed, as well as an S700X1 with 700 mm travel in the X-axis. All four were delivered within the space of one month. 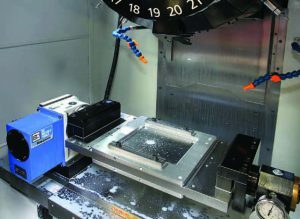 The larger machine is fitted with through-spindle coolant and a faster Yukiwa CNC indexer, which rotates at 200 rpm, double the speed of the Kitagawa indexers. Mr Cobb continued, “All of the indexers fitted by Whitehouse are not only fast but also very rigid during machining. It is because they are clamped hydraulically at both ends, rather than being held by the servo motor. “It allows us to take heavy milling cuts without vibration, maximising productivity and prolonging the life of the cutters. it optimal for machining the various grades of aluminium that account for around 95 per cent of production at the Nottingham factory. He believes that higher speed spindles lack torque and require unnecessarily costly, balanced tooling, while lower speeds are not enough for productive removal of light alloy. Rapid spindle deceleration to zero for tool exchange and acceleration to full rpm as well as quick indexing of the 21-station turret combine to bring the chip-to-chip time down to 1.4 seconds, cutting out a lot of idle time. Tapping at 6,000 rpm also promotes high productivity, as do 50 m/min rapids in the linear axes, up to 30 m/min cutting feed rate and axis accelerations of up to 2.2g. A comparative analysis of the cutting data from the standard VMCs and the new Speedios at Hemlock reveals that, on average, the former are in-cut for 45 per cent of a cycle whereas the Brother machines are cutting for 66 per cent of the time. It results in a massive potential increase in metal removal of nearly 50 per cent. Another facet of the machines that Mr Cobb appreciates is the power of the latest Brother CNC system. It has faster processing and 200-block look-ahead, enabling higher accuracy machining, especially in 3D. It also has many standard features that are costly extras on other controls. He pointed to the Brother CNC C00 specification at the URL: www.brother.com/europe/machine/sx1/spec/ index.htm#spec-nc and noted that 58 features are standard in the proprietary control and only five are options. In conclusion, Mr Cobb said, “Our new Speedios will give any of our competitors a run for their money, whether they are in Budapest, Beijing or anywhere else in the world. “We plan to replace two of our standard 40-taper VMCs with two Speedios every year for the foreseeable future in a bid to halve production times right across our shop floor. “We have around 2,000 job numbers here. It takes time to swap jobs from our existing machines to the new platform because we rewrite each program, rather than just edit and transfer it. Most cycles, invariably involving interpolation in up to three axes plus indexer positioning, are created off-line using seats of hyperMILL and Mastercam. Occasional data input is required on the shop floor for programming simple jobs or to edit cycles. Further advantages of the new Brother machines are their low power consumption, which reduces electricity bills, and their superior accuracy, with 10 microns positional tolerance routinely held by Hemlock at its Nottingham factory. The proximity of Whitehouse Machine Tools’ HQ has also been a benefit. The Brother agent’s applications engineers frequently visit the Nottingham subcontractor to assist with setting up jobs and to give advice.